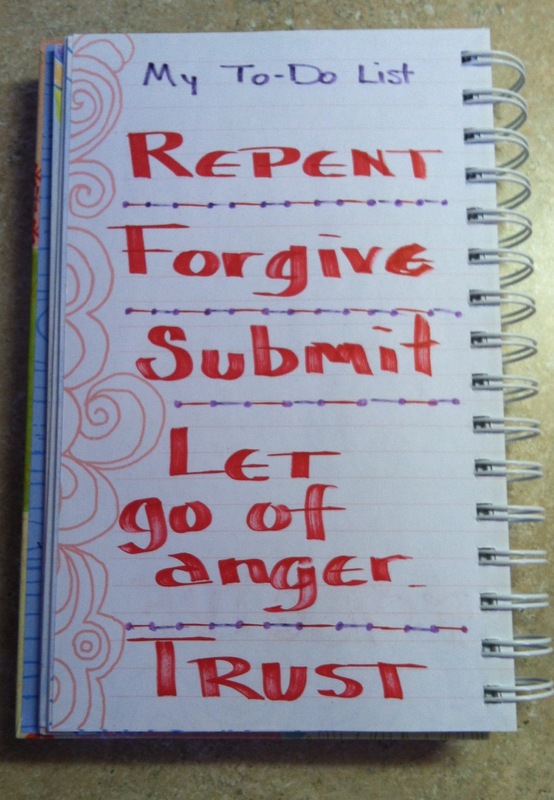 This was on one of my journal pages today. How fitting for my Monday Madness. 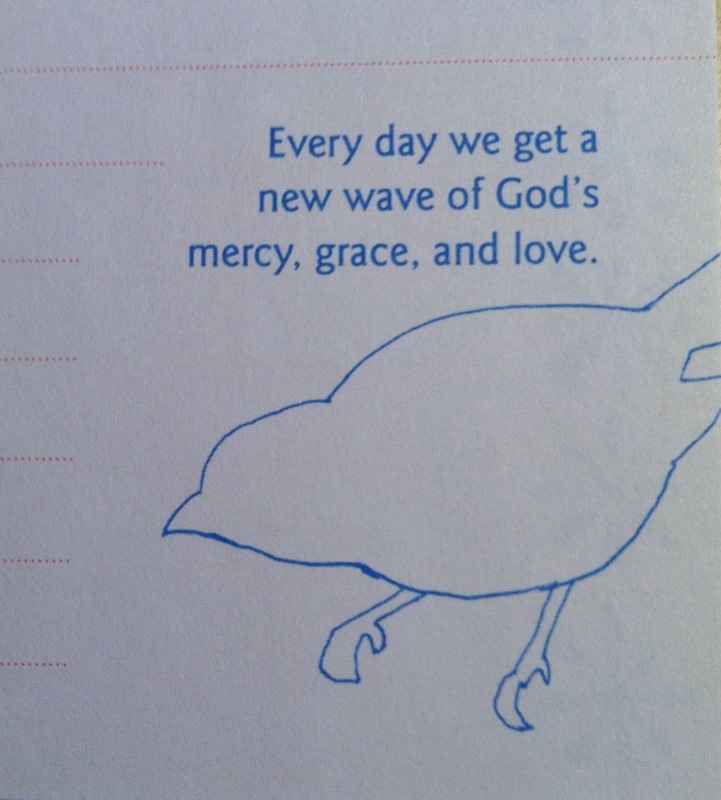 Every day we get a new wave of God’s mercy, grace, and love, and boy have I needed it today! It’s Monday. The kind of Monday to complain about, when nothing seems to go right, and emotions are not being kept in check. Yet it is all my fault that it was that kind of morning; a Monday morning full of sinful, stubborn selfishness! Ugh!! Have you ever had a day like that? I knew I could not and did not want to carry on this way for the whole day. I had to stop, and change my attitude. The sooner the better! I took myself to time-out; calmed down; assessed the situation, made a to-do list, and got started. Purify me from my sins, and I will be clean; wash me, and I will be whiter than snow. Was yours a Monday of madness? It’s not too late to start over. You can even borrow my to-do list. Take credit for your contribution to the madness, and make a change now. You’ll be glad you did. Shhhhhhhhhhhhhh. It’s quiet time. Sometimes with a houseful of small children, or even just one youngster, quiet time can be as beneficial to Mom as it is to the kids. As my children outgrew their afternoon naps, they graduated to quiet time. This time was usually for a half hour to an hour and books were quietly looked at. Each child had a blanket and pillow, and then laid down on the living room floor. I got comfy in the recliner with my own reading material, which was often times my Bible, or journal. Sometimes the kids and/or I would would even doze for a bit. It was amazing how as short as half an hour of quiet could re-energize me, and spread peace and companionship among the children. The children got up ready to play together again. Quiet time was welcome and refreshing. Our quiet time with God can and should be the same, welcome and refreshing. I especially enjoy spending this time outside, and have several niches in my yard landscape to invite a quiet sit. Out there I am not distracted with electronics or other man-made niceties, but I can easily reflect on God’s abundant grace and love. It is a place I can pray, listen, ponder, spend quiet time with God. Recently, at a women’s meeting, the speaker addressed the fact that so often we get so busy DOING things, we don’t take time to rest quietly. This does not mean you have to lay down for a nap, but think about it. If we are constantly on the go and our time of prayer is only petitions and telling God what He should do, how are we ever going to hear his quiet gentle voice? In the Bible, Mark 6, The apostles gathered around Jesus and were reporting all they had been doing. In fact, they were ministering to so many people, they hadn’t even had time to take a lunch break. They were tired and hungry, and Jesus said to them, “Come with me by yourselves to a quiet place and get some rest.” (Mark 6:31) I believe Jesus would like to extend that same invitation to you and me. My speaker friend thought so too. 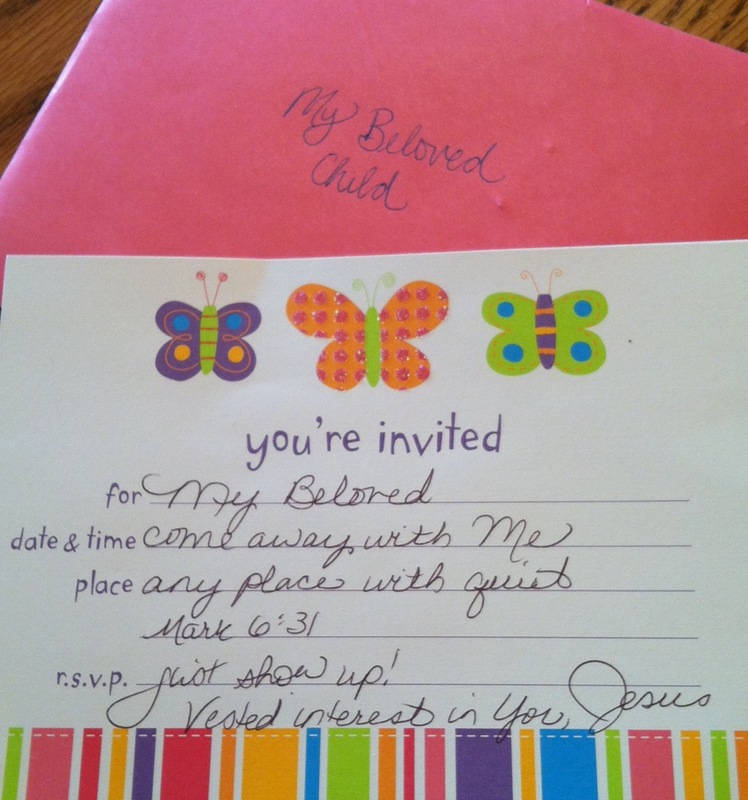 She made each woman in attendance a special invitation as if it were from Jesus, himself. I’d like to pass that invitation along to you. Find a time and place for some much needed quiet time today. You’ll be glad you did. Earlier in the week, we had our 18th snow for winter 2013-14. This is very unusual for our corner of the world, but we are so very grateful for the moisture. The snowfall was quickly followed by a couple days of springlike weather with temps in the 60s. With melting snow, tulips pushing through the damp earth, and goldfish playing at water’s surface, I was tempted to get my hands in the dirt. However, I restrained because I know Mother Nature is a tease. Instead, I whipped up a taste of spring with a few new recipes. The local grocery store has been getting in some beautiful, plump, sweet, juicy strawberries. We usually eat them fresh, whole, or sliced, dipped in chocolate or stirred into yogurt. 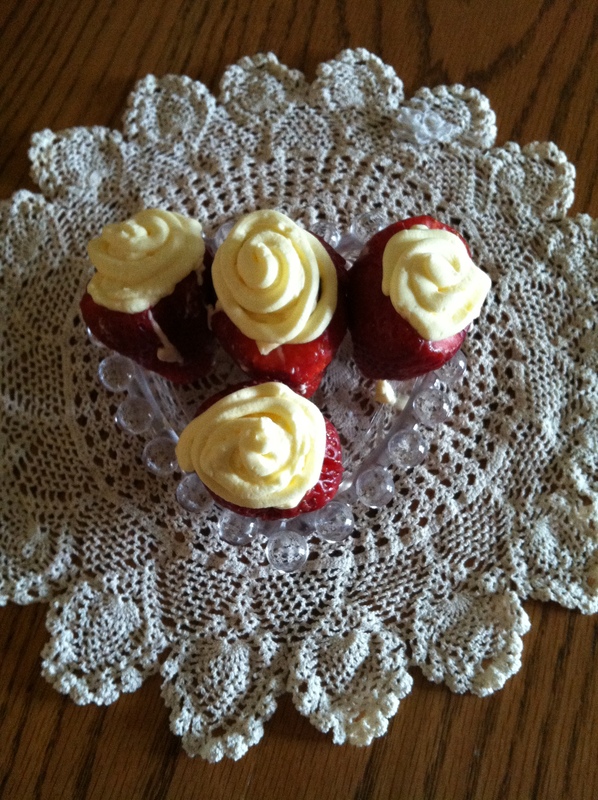 This time I made Almond Cream Filled Strawberries. An easy snack, appetizer or dessert that looks a tad fancy for my farmer. 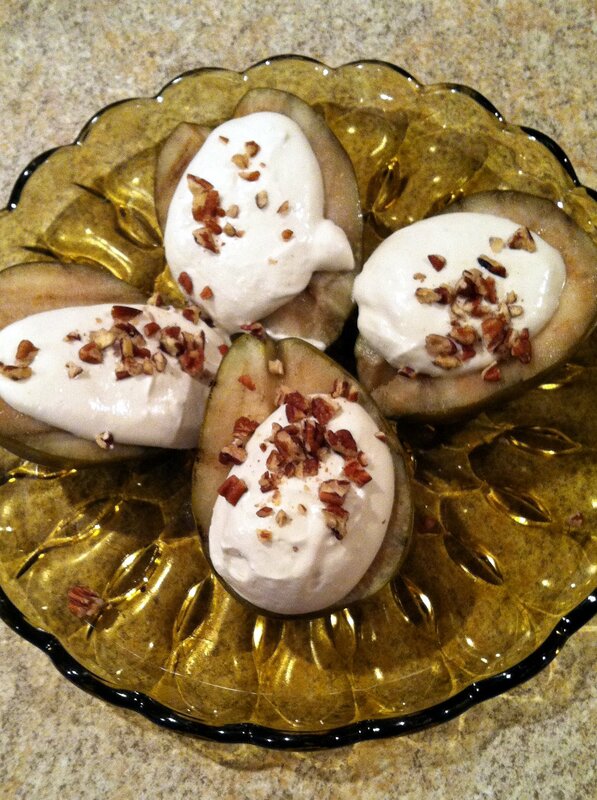 Since I had whipping cream left over, I got brave and made some Grilled Pears with Honey Roquefort Whipped Cream. This was not as big of hit, and I will not be making them again. Cold winds returned this morning. 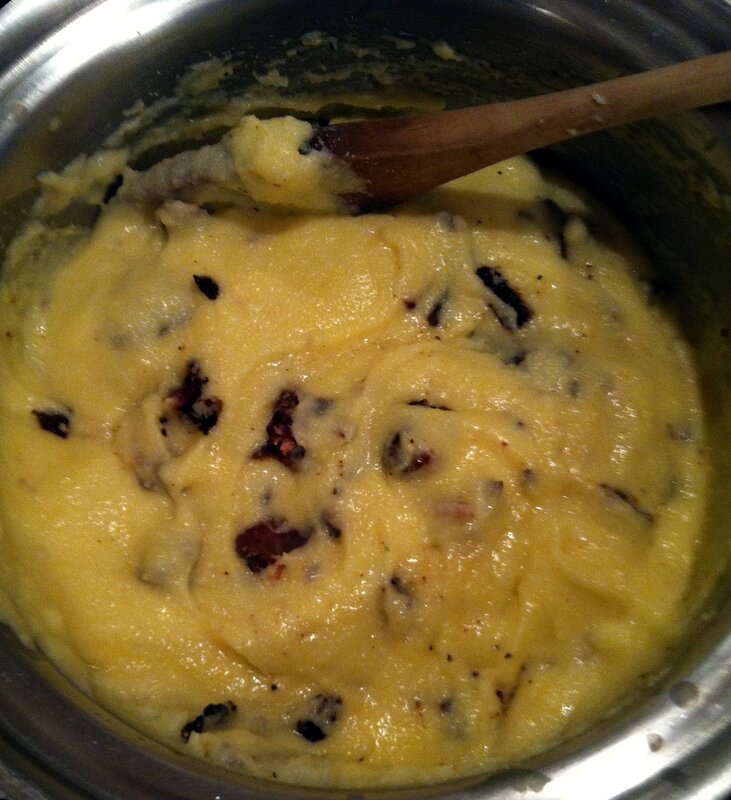 So while Hubby got a fire going in the wood stove, I made a batch of Bacon Grits for breakfast. What a delicious enhancement to plain grits! Of course, how can cheese and bacon not boost the flavor? We drizzled a bit of maple syrup to top it off. This will definitely become part of our breakfast menu rotation. The temperature is quickly dropping; wind is blowing tumble weeds south, and the fish are at pond’s bottom. Snow #19 is in tonight’s forecast, and a big mug of hot chocolate sounds very warming right now. A handful of lemons and limes are waiting for our next taste of spring. 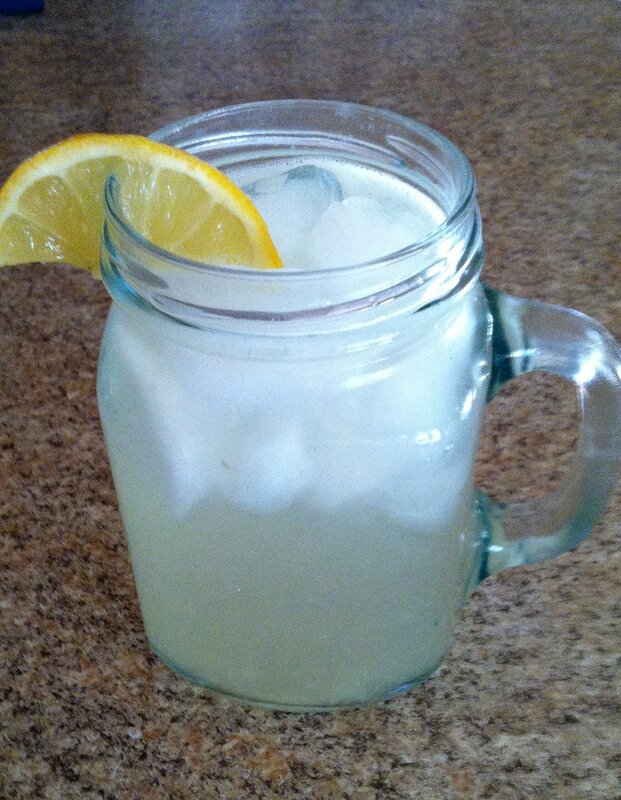 Monday is predicted to be in the 70s, and I’m already anticipating fresh squeezed lemonade or cherry limeade. This quote has been on my refrigerator for many years. I would love to give credit, but I do not remember when or where I first heard it. I do know that I heard it at a time when I needed such a reminder, because I was begrudging my duties. When one is in a position of service and the recipient makes demands or takes the service for granted, the servant can easily lose joy in serving. There have been numerous times throughout the years, when I needed to check my reaction as I served my family and others. Sometimes I would make a special dinner, but my hubby and children didn’t seem to even notice the extra effort and care I had put in for them. When we had company, my dysfunctional kitchen didn’t allow for much help from others. As I was working, I would be able to hear laughter coming from the living room. The laughter should have put me in a good mood, but occasionally I allowed the opposite. I would allow myself to feel left out, missing the fun, while I did all the work. Did you notice how many times I referred to “I” in the above paragraph? That was intentional, because when we are serving with a servant heart our thoughts and motives should not and will not be on ourselves. The Bible has much to say about serving God and others, and we are never told to serve for our own praise, recognition or advancement. Instead, we are told to serve each other humbly and with love. This little quote will remain on my frig door until I have it mastered. 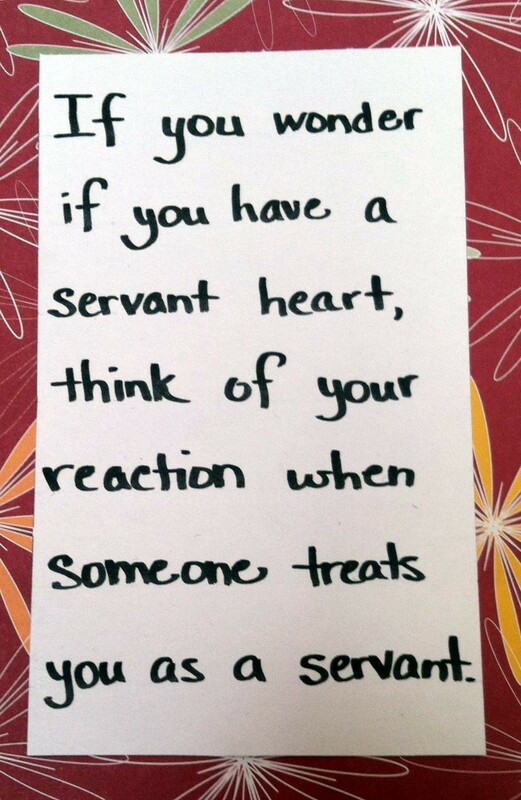 If you wonder if you have a servant heart, think of your reaction when someone treats you as a servant.